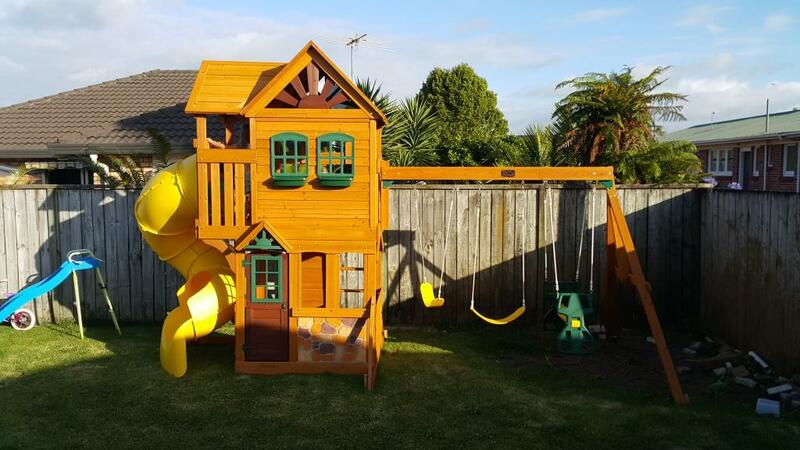 The Goldenridge Climbing Frame constructed with cedar wood due to its natural characteristics making it rot and infestation resilient and ensuring strength for years to come. With the climbing frame's popular tube slide coming from the crows nest attached to the fort. 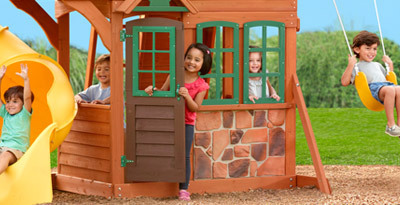 The climbing frame's fort is 1.5m above the ground, the lower play area is like a playhouse with a working door and windows. 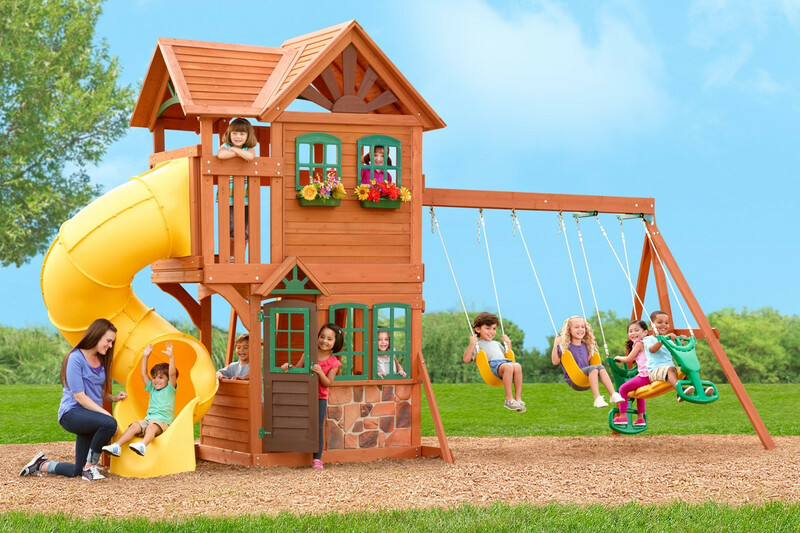 Two belt swings and a glider make up the play features of this climbing frame. 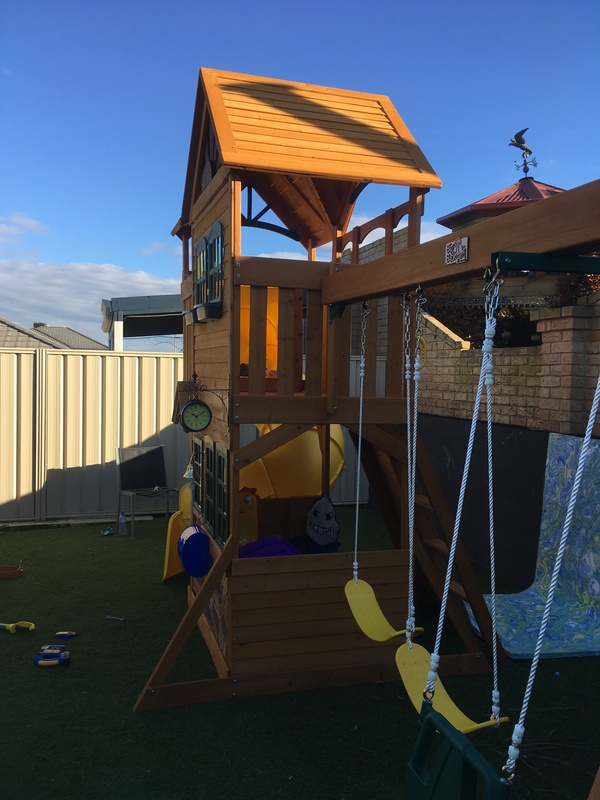 The Goldenridge Climbing Frame has a 1.5m play deck height accessible via either a rock wall or ladder on the climbing frames back. 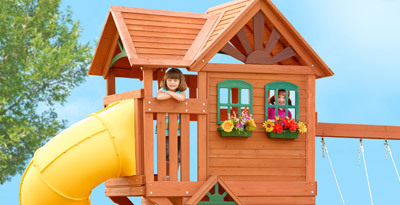 The climbing frames play deck includes two windows (pane less) for your children to peer out of. The climbing frame's slide gets you back down this is a colorful tube slide which, always a hit with children. The tube slide offers them an exciting descent nearly 3m back to ground level! The Goldenridge Climbing Frame tower there is a 3 position swing beam with two brightly coloured belt swings which are made from flexible plastic to offer support to your children while swinging and a two child glider where two children can sit back to back and rock backwards and forwards to their hearts content! The swingbeam on this climbing frame has two beams running parallel to one another to ensure maximum strength and durability. 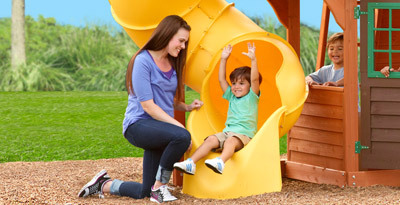 The Goldenridge climbing frame features one of our popular tube slides. These fully enclosed slides provide an exciting, twisting, speedy and secure journey back down to ground level. 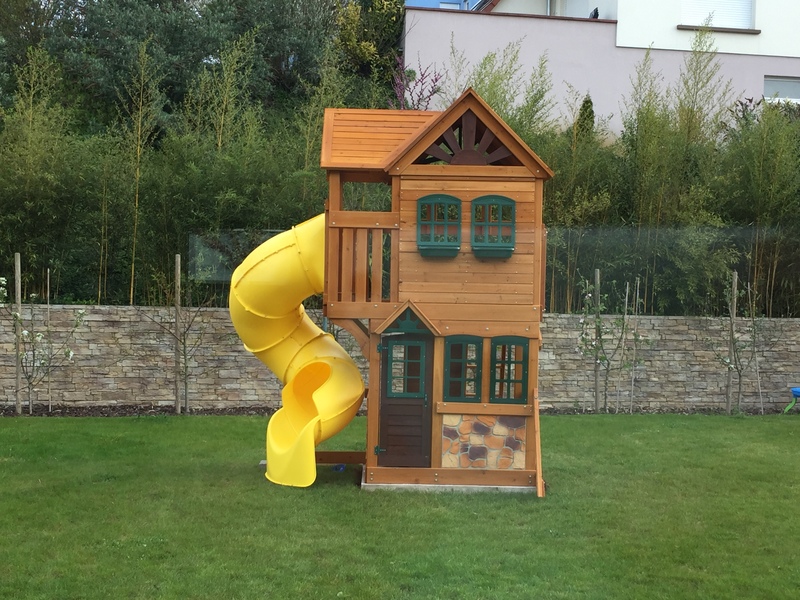 At the bottom of the slide there is a small lip and opening allowing your children to exit from the slide safely and securely. The tube slide is one of our more popular features and is a great space saving garden climbing frame accessories. 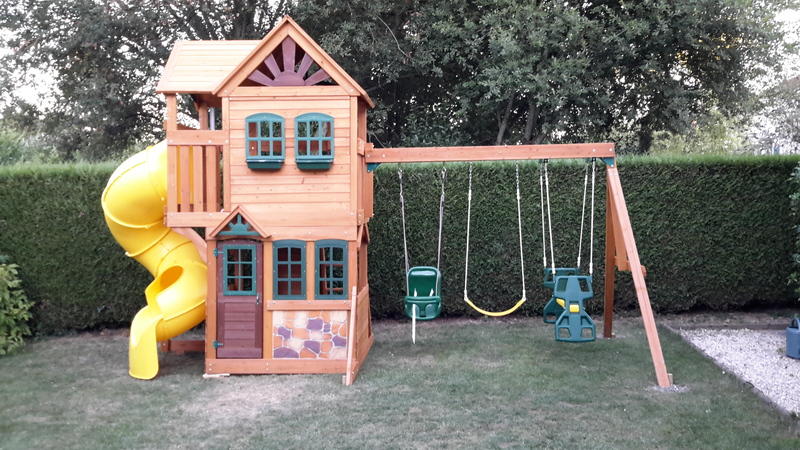 The Goldenridge climbing frame has is options for children unsure of their climbing abilities can utilise the standard step ladder located to the back of the set, whilst more advanced climbers can make their way to the top using the solid rockwall which features a combination of green and yellow rockwall mounts. Goldenridge climbing frame has underneath the play deck a partially enclosed cabin which makes for a good den for your children. There is a little door which is a beautiful finishing touch to this climbing frame. If you wish, this space can also be converted into a ball- or sandpit area – to achieve this put down some ground sheeting and then filling it with play sand. 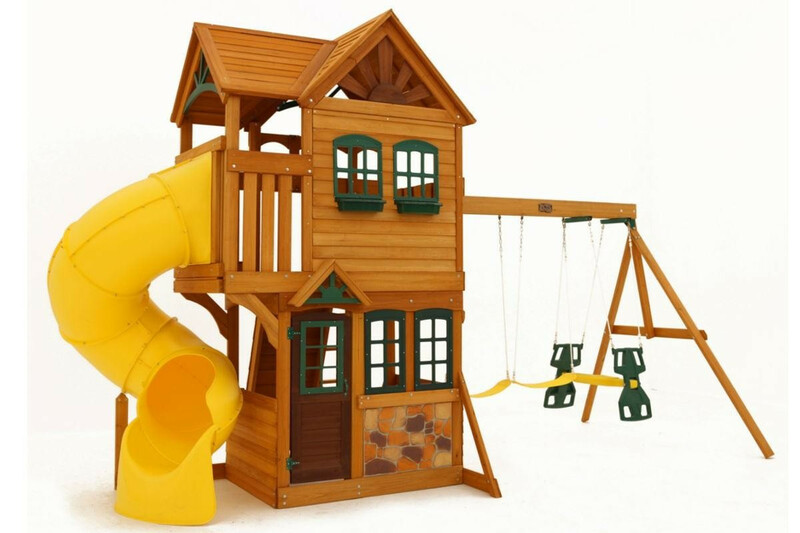 The Goldenridge climbing frame comes pre-cut, pre-drilled and pre-stained with a fully illustrated instruction manual. 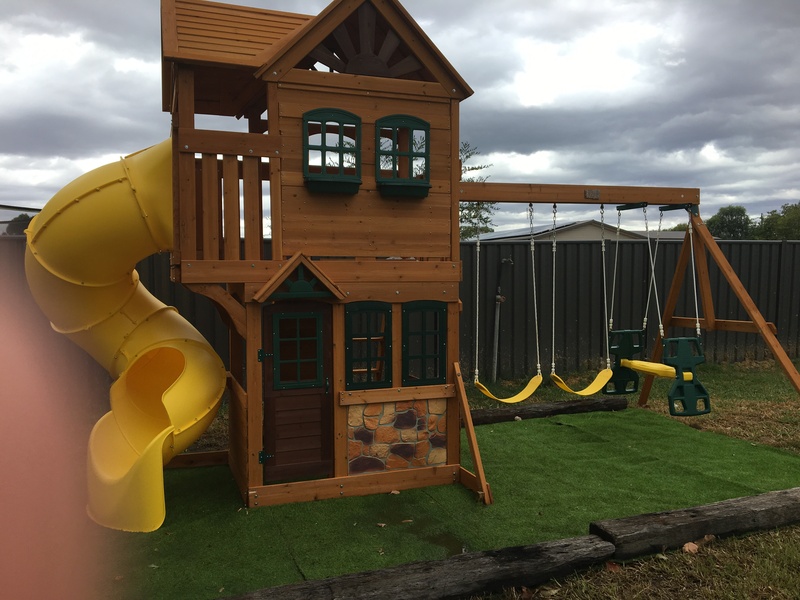 This climbing frame is designed for children aged between 3 and 10 years of age and is tested (EN-71 & ASTM) to meet requirements for private residential use – this climbing frame is not suitable for commercial use. Nous sommes vraiment contents de notre achat et je voudrais recommander cette marque, ça a été très facile de passer commande en ligne. Du service client à la livraison ils ont été très aidants. Même le livreur a été très gentil ! J'ai 3 garçons dont 1 avec un autisme modéré et c'est parfait pour tous les 3 !! Ils adorent aller à l'extérieur et ça complète très bien notre jardin. Merci beaucoup ! L'anniversaire des 3 ans de mon fils approchait et heureusement que je suis tombée sur votre site internet !! Ça a été un super moment pour mon mari et mon fils de le monter. Mon mari est assez bricolo du coup ça n'a pas été trop compliqué pour lui sauf pour le toboggan ! Comme on le voit sur la photo, l'aire de jeux rend vraiment très bien et j'ai vraiment hâte que tous les amis de mon fils viennent jouer avec lui. Sa petit sœur a déjà très envie de la tester ! Une superbe aire de jeu fidèle aux photos. Bois de bonne qualité, commande complète, un colis endommagé mais vite remplacé. Bien vérifier à la livraison. Par contre prévoir beaucoup de temps pour le montage ! Je recommande pour un cadeau hors du commun. Cela ne fait qu'un mois alors nous verrons si cela tient dans le temps. So glad that we found this website! I was looking for a birthday present for a three year old who already has everything, and luckily stumbled across this website. The deals were to good to look past, definitely value for money and the service is excellent. The ease that comes with buying from the site is amazing. And delivery was organised super fast. We went with the Goldenridge climbing frame, which I think is going to provide years of fun for my two boys! Cannot get over just how good the whole set is, especially the tube slide. 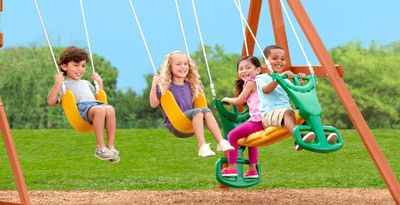 Supports enough weight for adults to join in on the fun too, very sturdy! Received on March '16, we built it one month later with my brother. We first create a concrete slab to be sure the structure never moves. We found the pickets were not strong enough so the structure is well attached to the ground then. The children are very happy with it. Even the smallest one. 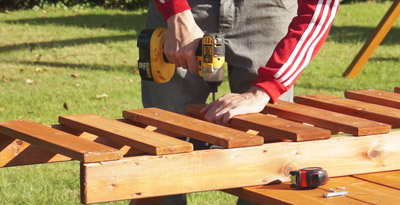 The wood is tender, so do not tighten the screws too strong. It easily supports the weight of an adult, even 2. We hesitate between selwood and another constructor/seller. But selwood seemed to offer better quality products and more funny playground. I don't regret my buying ! Our sons 3rd birthday is soon and thankfully I stumbled across your website! We live in WA and I discovered delivery to our door was very expensive! I organised a couple of furniture delivery guys to pick up in their truck- cheap way to do it! It was a great project for my son and Daddy to complete - a couple of weekends as rain interrupted. My hubby is handy so he didn't find it too challenging with the exception of the slide!